UP CIFAL Philippines held a consultation on the “Philippine Outlook on Migration and Gender Equality” on November 28, 2018 at the University of the Philippines School of Statistics in Quezon City. Thirty-five representatives from government agencies, universities, and civil society organizations attended the consultation. It aims to gather comments from different stakeholders on the working paper, “The United Nations Sustainable Development Goals (SDGs) and the Global Compact for Migration (GCM): A Philippine Outlook on Migration and Gender Equality,” an initiative of UP CIFAL Philippines to identify possible steps forward and strategies to address diverse migration challenges. 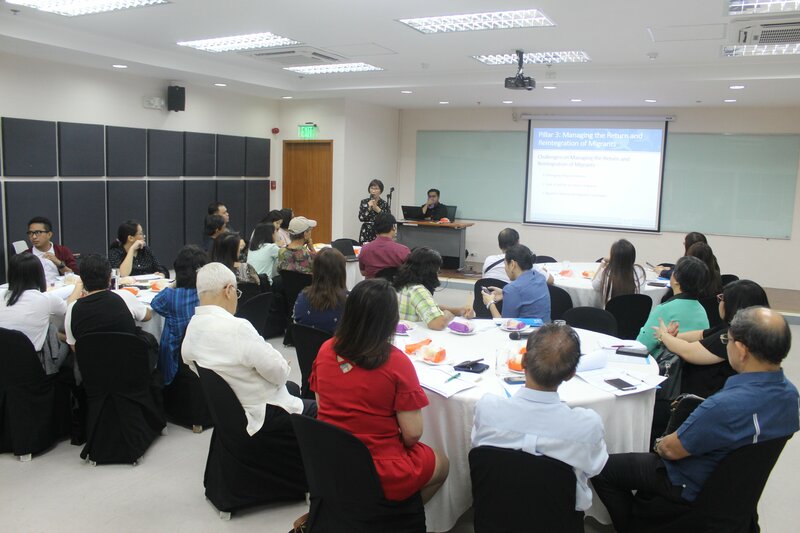 In March 2018, UP CIFAL Philippines convened a group of migration professionals to discuss the future strategies for the country’s diaspora. One key recommendation was the need to formulate an outlook that will chart the commitments and actions necessary for the Philippines to encourage the reintegration of migrants and fully realize the development potential of migration. The working paper outlines four pillars of migration: 1) Promoting Decent Work for Migrants, 2) Protecting and Promoting the Rights and Welfare of Migrants, 3) Managing the Return and Reintegration of Migrants, and 4) Migration to the Philippines. The document also recommends strategic directions based on the 23 objectives of the GCM. To provide accurate and timely information at all stages of migration (GCM Objective 3), UP CIFAL Philippines Director Dr. Edna Co emphasized that educational institutions should be involved in the pre-employment orientation seminar and pre-departure orientation seminar, which the participants say are often insufficient and conducted hastily. UP Asian Center Prof. Roli Talampas also suggested that families of the overseas Filipino workers (OFWs) be included in the seminars so they are also aware of the terms of the contract and how to properly manage the remittances. In terms of protecting and promoting the rights and welfare of migrants (Pillar 2), the non-portability of health care and social security as well as the vulnerability of migrant children were among the challenges highlighted in the working paper. Objective 22 of the GCM seeks to establish mechanisms for the portability of social security entitlements. The Social Security System argued that it services all its members, even the undocumented OFWs. The Commission on Overseas Filipinos pushed for an inter-agency committee on migrant children. This will help address and reduce vulnerabilities in migration (GCM Objective 7). To strengthen international cooperation for safe and orderly migration (GCM Objective 23), the Philippines addresses the discrepancy between migration policies and bilateral labor agreements with other countries by regularly reviewing the provisions and adding new ones, such as measures on checking and monitoring the working conditions of OFWs. As for the reintegration of migrants (Pillar 3), the working paper identified the need for diverse reintegration pathways as one of the issues. The Small Enterprises Research and Development Foundation of the UP Institute for Small-Scale Industries presented the handbook on reintegration of OFWs published by the International Organization for Migration. The handbook seeks to help concerned stakeholders in migration and development that provide reintegration programs and services to returning OFWs. This initiative will help facilitate the safe and dignified return and sustainable reintegration of migrants (GCM Objective 21). The group expects to hold follow up consultations on the Migration Outlook working paper, which aims to serve as an outline to a strategy on Philippine migration and development work aligned with the GCM and sustainable development.